My name is Frank, and while I don�t normally admit it, I�m over 60 years old (or young, as the case may be). 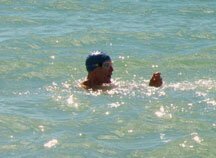 Swimming has been my main athletic activity�I usually swim more than 200 miles per year. Beginning about six years ago, I started to experience discomfort and varying degrees of pain in my left shoulder, which was treated intermittently with cortisone injections, physical therapy, acupuncture, prescription/non-prescription medication, as well as reducing or discontinuing swimming. In June of 2010, Dr. Cole performed a rotator cuff repair and biceps tenodesis on my left shoulder, after which I followed a lengthy course of physical therapy with Midwest Orthopaedics at Rush. The results have been little short of phenomenal, and I am very grateful to Dr. Cole and the staff of Midwest Orthopaedics at Rush for my recovery and the greatly increased quality of life that I am now experiencing. 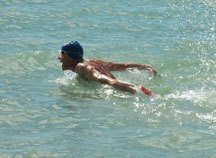 I�m attaching photos taken in late November of 2010 when I began swimming again. I have several suggestions for anyone who decides to have the kind of orthopaedic surgery I had: (i) Follow Dr. Cole�s pre- and post-operative instructions scrupulously�he can do miraculous surgery, but it�s the patient�s responsibility to assure that follow-on care and physical therapy occur as prescribed�they are essential for a proper recovery; (ii) Do not expect too much too soon after surgery�slow, steady, incremental rehab efforts over a several-month period will be required; (iii) Be patient and expect some degree of residual pain or discomfort during the recovery period�that will subside, but it may take several months; (iv) Hang in there and don�t give up�you�ll be as enthusiastic about the result of Dr. Cole�s efforts as I am!